At a time when the French government is taking draconian measures to stop motorists and motorcyclists speeding in France, some French politicians have recently had a taste of their own medicine with one of them losing his driving licence. Jean-Paul Huchon, President of the Greater Paris area (which doesn’t give him much power by the way) was caught going down the motorway on 23rd October 2011 at 171 kph instead of the maximum allowed speed of 130 kph. That is 107 mph instead of 81 mph. Huchon lost his driving licence straight away making him unable to drive until further notice. The French government has been installing speed cameras everywhere in the country in an attempt to catch as many motorists and motorcyclists as possible breaching the speed limits. Thousands of angry motorcyclists, represented by the very famous and well respected French motorcycle action group (Fédération Française des Motards en Colère), have been protesting en masse all over the country at the government’s decision to hide those speed cameras and remove signs warning road users of their presence in the affected areas. But unfortunately for Mr Huchon, the law is the law and politicians, unlike what most of them believe, are not above any legislation. They might in fact have a taste of their own medicine to see what it is like being caught. At least Huchon has accepted his mistake and said “the law applies to all citizens. It applies to me. I was not paying attention to the speed I was going at“. If all politicians were as honest as him, politics would be much more straight forward, wouldn’t it? It is not the first time that a politician gets caught speeding in France, although it is the first time as far as we can tell that a politician sees their driving licence taken away from them. As stated on an article from news.motorbiker.org, “Xavier Bertrand, the Minister of Industry, got caught doing 140 kph on 90 kph limited road. José Bové, the “ecologist”, all-round thug and former farmer (known for his strong anti-globalisation and anti-USA views) got caught doing 135 kph in a 90 kph road”. The article continues saying that “even the current President of France, Nicolas Sarkozy, does it. He got caught doing 190 kph on a 130 kph motorway, the former leader of the ultra-right political part, Jean-Marie Le Pen doing 185 kph on a 130 kph road, François Bayrou, leader of the centre party, caught at 120 kph on a 70 kph, stretch and former Presidential candidate Ségolène Royal was doing 158 kph on a 110 kph road. 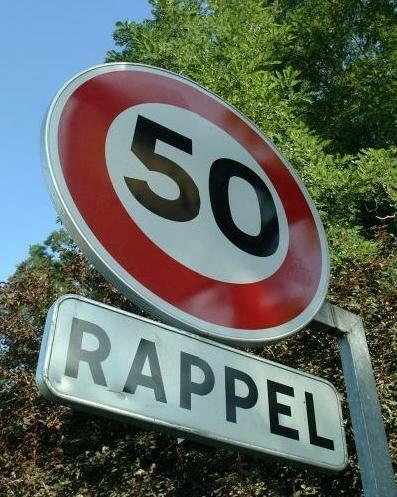 The current Minister of Foreign Affairs, Alain Juppé, got caught doing 105 kph in a 90 kph zone”. We are not sure what sanctions, if any, were imposed on these politicians for their obvious breach of the French highway code. If these guys get away with speeding, then what credibility and respect can we, road users, have for them?